My family is a big fan of Leapfrog products we currently have the Click-start, Leapster2, and Tag systems. 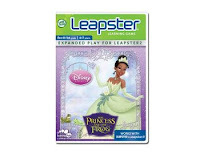 So I was a little disappointed with a recent purchase we made of Disney's Princess and the Frog for the Leapster. I had reviewed the online trailer and thought it would be a good addition with both math and spelling games. The game has the characters and sounds from The Princess and the Frog. But it lacks originality and seems like a recycled version of other Leapster games. One big detractor is that the sound clips are often repeated back to back. It seems as though Leapfrog rushed to get this product out in time for Mardi Gras and ride the wave of the movies popularity. In doing so they created a product that is similar to other Disney games and left this consumer feeling a little ripped off. As a parent I have come to expect games from leapfrog that help my child to master concepts in a fun, novel way. This one misses the mark.